she excitedly shared it with the group however it seems that someone ripped half of the sheet this time.... Oddly enough only Ichiro could read it because the hand writing was so messy. 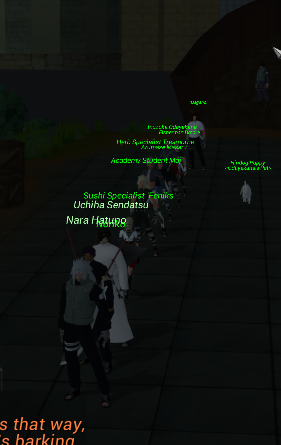 Quickly after they would scavenge the Uchiha distract which was littered with kunai and notes attached to them. A good while of searching got the genin frustrated, but they prevailed! As Kaika found yet another piece to the puzzle. They had to go up high now, and so they did! The group checked each and every tower before finally getting the final clue. however you still have one last clue to decide before reaching your goal "If the last clue to reach your want, go to the 2nd floor you must, that place where the errands come from"
Which awaited them in the mission room. Their search ended back at the academy, where their teacher would await them with a handful of tokens. *Kaika ignored emotes made by me that could lead to further roleplay, forcing me to void myself in order to successfully culminate the event. The details regarding this were sent to Lunamaru. Last edited by xLeaf on Mon Dec 17, 2018 4:49 am, edited 2 times in total. Duration: 1 Hour, 5 Minutes. Mission Details: As requested by some individuals, an academy class was hosted by Tenshin, the goal of this one was to introduce the participants to the use of bukijutsu, to be more precise, during this class shurikenjutsu, they were asked questions about Bukijutsu and shurikenjutsu to address their knowledge regarding these… That in the end was determined as 0, this forced tenshin to approach them in a more practical way, leading them towards the training grounds with the aim of teaching them first-hand the art of shurikenjutsu. Additional NotesThe participants lacked of interest or participation about emoting, often forgetting to do even simple human behavior reactions like a nod or even answering to a question, forcing me to remind them oocly that they must react to tenshin emotes, however after they were told this they significantly improved their roleplay during the class until the culmination of this. Duration: 5 Hour and 10 minutes. Mission Details: All students or genins who have previously attended one of the tenshin classes, or have been assisted by him during a training session were called by tenshin so that he himself could verify their progress personally, although it was because they trained independently using what tenshin taught, or because they improved after spending time by his side training. Later after the participants arrived, they were taken by tenshin on a walk to a lake near konoha, after he left record that he was leaving with that large number of students outside the village they continued their walk until they reached to the lake. Once there, the students were informed that it would not be any common evaluation, and that they would form teams of 2 and they would fight each other in a tournament-style format until only 1 winning team remained. All while being evaluated by tenshin. Due to the total amount of pictures that were taken from the beginning of the event until its culmination (46)to log every single emote made in order being to big, i decided to upload pictures to mega in a .zip file where any RPE could look at them with ease. All of them would be ordered instantly by just selecting the "Sort by date" option. This because currently my internet wont allow me to upload every single picture to hosts like imgur because for my country the upload speed is very slow, hope yall can undestand. Additional Notes: During the evaluation, one of the participants "Kena", immersed in the water in an irresponsible way and apparently ended up being captured by a sea serpent that would have ended her life if Sendatsu didn't intervened valiantly, this while others watched or continued their fights without idea. Tenshin acknowledged that It was the perception of Sendatsu with his sharingan and the brave will of fire he bears what made him submerge in the water totally ignoring his own life in order to save a partner. But of course, tenshin was watching all the time, if the student had been in imminent danger of death, he would have intervened in a second, but he preferred to wait and see how the other participants reacted when they saw one of his companions submerge himself underwater and not return. At the end of the evaluation the 2 finalist teams were instructed that they should form a single one to face tenshin and sendatsu. Event Date: 10/12/2018 or probably earlier, unsure due to the event being hosted many months ago. Mission Details: The participating students were put to test in a simulated environment in which they would be persecuted by Tenshin, before beginning Tenshin recommended the students to choose a leader for their team, they selected Aimo for the task, their mission was either to escape as a team, or to incite tenshin capturing him or leaving him out of combat, they would lose by default if any of the members of his equipment was captured, they would be persecuted through the village by tenshin, and to reach the other end would pass successfully. This was done in order to improve their teamwork, coordination and performance for both individual and group cases, with the premise that in the future they would be part of a squadron. At the end of the exercise, the only one still standing was Rooku, since the others were left out of action by Tenshin. The participants were told to do "Relevant" emotes in team chat, considering that i was out of range to allow to create the illusion of an Immersive "chase". Aimo, Ichiro, Ryouken Shendomaru left before the event culmination in that order without warning me previously, nor prividing a justification for it. Mission Results: Failed, since they did not complete the agreed clauses. Event Date: 11/12/2018 ish according to the date in the pictures. Mission Type: Hand-to-hand combat training session. Mission Details: The participants were notified that in the future they would be forced to face other shinobi in hand-to-hand combat, so it was vital that they improve at all costs. Later after being introduced to the class, they were notified that the training would be based on 1 to 1 matches. By the end of the training the participants were completely exhausted, but it can be said that they had a significant progress in general, in relation to their hand to hand combat mastery. After witnessing that, the class was cataloged as successful, because it fulfilled its purpose.